LG Optimus T Review - Learn everything you need to know about the LG Optimus T before you buy. -If you are looking for a mid-range smartphone device that you don’t want to pay much for (and you are committed to T-Mobile), the LG Optimus T is it. $29.99 with a new/renewed contract…that’s phenomenal! With the phone running Android 2.2/Froyo, you would expect a slower processor to generate a slower experience-not necessarily. If you are looking comparatively, then yes. But if this is your first smartphone, you should be very pleased. With only a 3.2-inch WVGA screen you might be left wanting a bit more acreage. However, the screen still puts out great color. 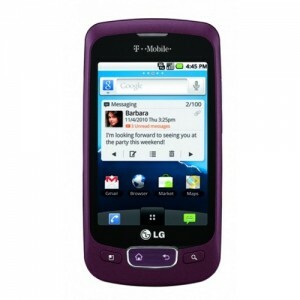 The LG Optimus T provides great value for exceptional quality. -The Optimus is an overall smaller phone than most of the average smartphones on the market. The screen, 320 X 480 pixels, feels a little plasticy (yeah, that’s a made up word) but still shows vibrant colors. The volume rocker (on the right side) and the power button (on the top right side) are both a little difficult to press as they are both small and hard to feel. The buttons on the face of the phone are a little difficult to press as well as the two on the side are both recessed a little bit. -The 3.2 MP camera is definitely sub-par to any 5 MP camera. That being said, it only being 3.2 MP, it takes pictures just fine. Of course that means the video camera isn’t that great either. Viewing videos you have taken on the phone aren’t that bad, but when blown up on a computer screen, they look grainy and sluggish. Android 2.2 does allow you to sync your contacts with a number of social media sites allowing for ultimate integration. -The official battery life is about 6.5 hours with 18 days of standby time. The 18 days of standby time is pretty impressive considering most phones are closer to 15 or 16 days. Basically this means that if you are heavy user you will barely make it through one day. However, if you are getting this phone it probably means you are not a heavy user so you should be just fine. -A couple of cool features on this mid-range phone are Wi-Fi calling and visual voicemail. Wi-Fi calling allows you to make calls while on a wireless network and it doesn’t use up your minutes. Of course the phone comes with integrated GPS and Bluetooth capabilities. It also has an FM radio which is pretty cool as well for running or what not.